Regarding love, death, and cryonic preservation. NEW tells the story of an elderly couple who are cryonically preserved (chilled to sub-zero temperature) at the time of their deaths. They awaken centuries later, their health – and youth – totally restored. Together, they face the joys and challenges of a second life in the distant future. There aren’t many science fiction movies made for grown-ups. So, I made one. Principal photography on our ambitious short film wrapped in August 2013. Before production even began, NEW had already won one prize: a prose adaptation of my script won 1st place in the Redwood Writer’s Group 2012 science fiction short-story competition. NEW couldn’t have been made without generous help from family, friends and strangers. It’s worth checking out the original crowdfunding pages here, and here to learn more about how NEW came to be. In particular, look at the updates pages for behind-the-scenes photos and details on our production. Get NEW on Blu-Ray or DVD: Just ten bucks plus shipping, and they come with plenty of cool extra features included. Supplies are limited and when they’re gone, they’re gone. ORDER NOW! April 28, 2017 Sometime this month NEW had its 20,000 view at Vimeo.com. November 9, 2015 NEW got this sweet write-up at io9.com, the site for all things sci-fi. Check out the lively comments section where viewers are geeking out hard debating the economy and technology of the future as depicted in NEW. It pleases me no end to see people thinking this hard about the film. November 2, 2015 is the date we’ve set for the online debut of NEW. Free to view for all, right here! Or, visit the Vimeo page. October 17, 2015: NEW screened with three other Sonoma-County-produced shorts at the Petaluma International Film Festival. August 9, 2015: At long last the discs and other perks are in hand. Donors, watch your mailboxes! And, thank you for your patience. Once perks are mailed out, we’re planning an online release for NEW, probably around the end of August. 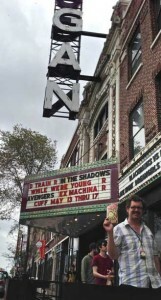 May 17, 2015: Sheila and I got to take a trip back to her hometown for the Chicago Underground Film Festival. Nine of her family members turned out for our screening! FEBRUARY 5, 2015: NEW returns to Nevada for a screening at Dam Short Film Festival in Boulder City. 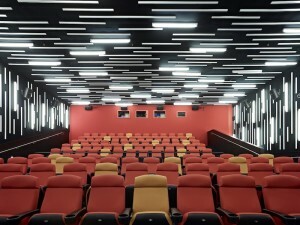 DECEMBER 13, 2014: NEW plays the super-cool New People Cinema in San Francisco’s Japantown. We’re part of a block of seven short films in the 11th annual Another Hole In The Head Film Festival, an 11-day celebration of horror, sci-fi and cult cinema. DECEMBER 6, 2014: The inaugural Other Worlds Austin Film Festival brings NEW to the Lone Star State. Two screenings at this brand-new, all-sci-fi festival! DECEMBER 5, 2014: The BFI in London is currently presenting a huge program – pardon me: “programme” – of films under the banner “Sci-Fi: Days of Fear and Wonder.” NEW screens December 5 with a selection of short films curated by our friends at the Sci-Fi-London Film Festival. NOVEMBER 20, 2014: Our special public screening of NEW took place at the Raven Film Center in Healdsburg. Cast crew and VIP donors were in attendance for the evening and it was a fine time. Many thanks to the evening’s sponsors and the friends and family who worked hard to help us pull this one off. Pics and stuff coming soon. NOVEMBER 12-16, 2014: NEW gets four, count ’em, four screenings at the upcoming Napa Valley Film Festival! Come out and drink wine with us. We’re part of Narrative Shorts Program 2, click here for dates and times. NOVEMBER 8, 2014: NEW has been invited to screen at End Death, a convention for cryonicists and futurists to be held in Laughlin, Nevada. I’ll be attending to introduce & talk about the film. AUGUST 31, 2014: Three screenings at Film Fest Twain Harte (CA) culminated with NEW taking the “Critic’s Choice” trophy for best short film. NEW was chosen for this honor by San Francisco Chronicle film critic G. Allen Johnson. MAY 17, 2014: Our second crowdfunding campaign has surpassed its goal! Thanks to everyone who has donated to this project! Your belief in our dream is making all this possible. MAY 4, 2014: NEW had its world premiere at the Sci-Fi-London Film Festival in London, UK. We understand the film was warmly received by audiences. More news coming soon! Check back often and sign up for my mailing list so you don’t miss anything! Great film – such an interesting idea and so very well realised.